Here is a list of activities we undertake. If you wish to get involved in any of these activities we would love to see you. 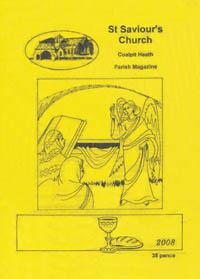 A magazine costing 50p/month is carefully constructed each month, from the excellent contributions received from our parishioners. A years subscription (12 months for the price of 10, with free delivery) is available at the bargain price of only £5.00. If you would like to submit an article or notice for the magazine please contact the Editor Derek Simmons before the 12th of the month. All subscription and advertising enquiries are managed by Gordon Mountstevens. We run a Fairtrade stall in the church on Wednesdays from 2pm-4pm and on Sundays after the 9:30am service, as well as at a few other times. We stock a wide range of items; sweets, biscuits, oat bars, cereal, rice, pasta, honey & jam, tea & coffee, kitchen roll etc. 15% goes to local causes. Which? magazine recently (March 2008) gave Fairtrade coffee a very high rating for excellent taste. Please bring some change with you. For more information please contact Andrew Brander. Thanks to Edna Snaith for her work on this. St. Saviour's supports a number of charities, either as part of the Local Ecumenical Partnership or on an individual basis. The charities included are : Christian Aid, Water Aid, The Leprosy Mission and Sight Savers. Each year we donate to Mission to Seafarers and Church Missionary Society. Supplies of food are collected on a continuous basis for donation to charities supporting the homeless in Bristol. Help us in our work, by making a donation or acting as a coordinator. Our Summer fayre is normally held in the last week of June. See our events page for the date. If you would like to help run a stall, please contact Gordon Mountstevens. We run three jumble sales during the year, in February, July and October. See our events page for dates. You are welcome to bring Jumble down from 10am on the day and to come to view the jumble from 2pm. Entrance fee is 20p. If you can help run a stall, please let Joan Coles know. If you are able to help in any way, it would be much appreciated. If you are looking for something else you might find it on our groups page or our social events page.